The Smith River is located in central Montana heading north toward Great Falls, and eventually blending into the Missouri River. Montana’s department of Fish, Wildlife and Parks has approximately 60 river miles designated as a state park, surrounded by state and federal lands and dotted with private land as well. Each year, the Parks department holds a permit lottery for “do-it-yourself-floaters.” The limited permits help maintain a quality experience for those lucky enough to draw a permit. In addition, there are commercial permits owned by fly fishing outfitters under the Parks department rules and regulations ensuring that all river users have a fair opportunity to experience this wild and scenic river at its best, pristine, wild, and scenic. Mike Geary, owner and operator of Lewis & Clark Expeditions (as well as Healing Waters Lodge), is the largest outfitter on the Smith River, and has successfully taken folks on float trips down the Smith for over 25 years. Anyone that has floated the Smith can describe what they’ve seen on the river, limestone cliffs, forests, wildlife, starry nights; and then, go on to describe how they feel after coming off the river, calm, peaceful, awestruck, in love. The experience can change you. Our business is to take you down the Smith River in comfort and style, with experienced fly fishing guides and support staff that set up our camps, prepare great meals, and manage all of the equipment and necessities to make the 5 day/four night trip. 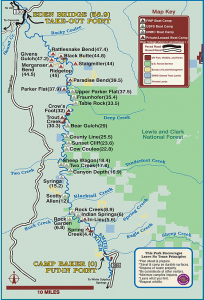 Our client’s focus is on enjoying the Smith River corridor and catching trout. Simple as that. Call Mike at 406-459-2030 for more information about the 2018 Smith River float season.